Dutch postcard by Rembrandt Uitg. Mij, Amsterdam. Image: Walt Disney. Publicity still for Pinocchio (Hamilton Luske, Ben Sharpsteen, a.o., 1940). Caption: ""Who is there? ", Gepetto called rattle tandingly." The second full length animated Disney classic, Pinocchio (Hamilton Luske, Ben Sharpsteen, a.o., 1940), is based on the 19th century Italian novel of the same name by Carlo Collodi. The kind woodcarver Gepetto creates a wooden marionette, which he calls Pinocchio. His wish for Pinocchio to be a real boy is unexpectedly granted by a fairy. The fairy assigns Jiminy Cricket to act as Pinocchio’s ‘conscience’ and keep him out of trouble. Pinnocchio is weak-willed and Jiminy is not too successful in his endeavour. Pinnocchio doesn’t always listen to reason and most of the film he is deep in trouble. The story has never a dull moment. In fact Pinocchio is about childhood and temptation. Tasting jam, stealing, not going to school, lying, childhood is full of temptations. Everything is new then everything looks pretty. When the standard for kids is to obey to authoritarian figures who know the best for them, the most precious lesson in Pinocchio is not to obey for the sake of obedience but to follow your conscience. Differentiate between right or wrong. That’s what being a real boy is about, being unselfish, trustful and brave, not being obedient. Although the atmosphere is quite dark and creepy in some parts, most of the time Pinocchio is a sweet fairy-tale. It is entertaining, heartwarming and magical. Animation and soundtrack are superb. Made shortly after Snow White and the Seven Dwarfs, the film showed marked improvement in the art of animation technology with startling special effects. The animation makes brilliant use of the multiplane camera, featuring a sprawling opening sequence in which the viewer practically sees the entire village at night. Gepetto’s inventive clocks come to life as realistically as any real-life photography could do. 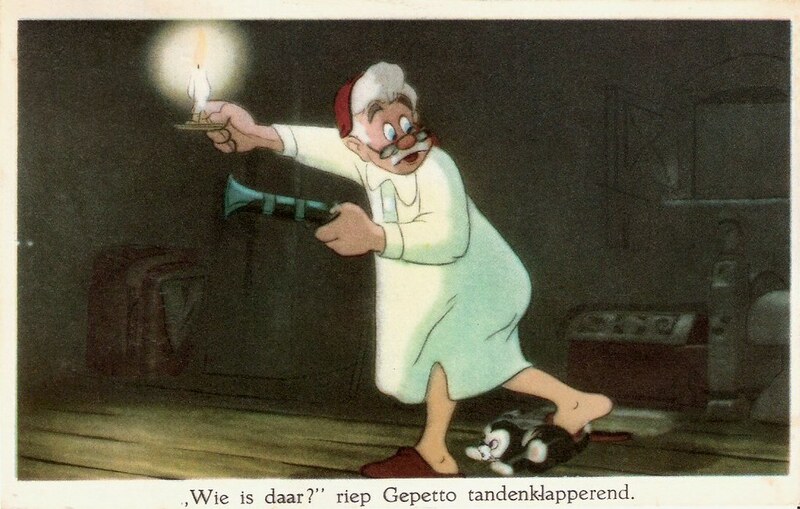 The scene of Gepetto searching for Pinocchio with a lantern on a rainy night after he has been captured by Stromboli is unforgettable imagery. The characters are colourful and fun. Pinocchio is cute, innocent and lovable like a human child, although stubborn and prone to temptation at times. Jiminy Cricket is humorous and cool, but a bit impatient.Pinocchio is full of sweet characters like Gepetto’s goldfish Cleo and kitten Figaro. Honest John Foulfellow, his sidekick Gideon and Giddy are the perfect comic relief. Giddy is a cat and a funny mute character. Honest John is the epitome of the sly fox: not ‘really’ evil, but clever, hilarious, charming, shameless, unscrupulous and greedy. And Monstro, the enormous sperm whale, is one of the most impressive animated beasts of all time.